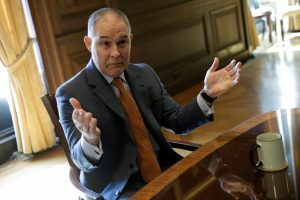 EPA Administrator Scott Pruitt last week said he would seek to bolster the agency’s lagging Superfund program, after the release of a report recommending ways to expedite the cleanup of the nation’s most egregious toxic waste sites. A Superfund Task Force, created by Pruitt in May, tendered 42 suggestions on Tuesday to streamline the remediation of more than 1,300 Superfund sites, many of which have remained unaddressed for years. While Albert Kelly, who chairs the task force and is a senior adviser to Pruitt, said the plan would increase efficiencies, environmental advocates contest that it could protect the very industries behind the environmental problems in the first place, while emphasizing redevelopment and hurried fixes over sound remediation practices. More than 1,100 Superfund sites are privately owned. The pace of remediation at sites on the Superfund program’s National Priorities List has slowed to a crawl recently amid funding shortages, bureaucratic blockades, bankrupt businesses and decades-long court battles with companies deemed responsible for the pollution. The number of remediated Superfund sites dropped from 85 in 2003 to eight last year, according to the environmental advocacy group Center for Health, Environment and Justice (CHEJ). In 2016, 53 million people in the United States lived within 3 miles of a Superfund site, leaving them in danger of potential health risks. Kelly told NewsHour the EPA would move to work with the companies liable for the hazardous waste, called “responsible parties.” The agency wants to develop quicker solutions for remediating the sites and to avoid lengthy litigation and feasibility studies that can add years to clean-ups, Kelly said. Among the task force’s five goals are spurring private investment, enticing redevelopment of the sites by working with lenders and offering financial incentives to the responsible companies, and communicating with surrounding communities on Superfund issues. Some of those actions would be put into play within 60 days, Kelly said. Gibbs pointed to a section in the report that encourages private investment as an example of this redevelopment blueprint, and said the report does not lay out how companies that were already reticent to get involved with clean-ups would change their minds, particularly with the Trump administration’s proposal to slash the Superfund budget, which could hamper federal enforcement. The task force’s announcement comes as the Trump administration has proposed 30 percent cuts to the Superfund program and the EPA, and worked to undo environmental policies — such as clean air and clean water regulations — put into place during former President Obama’s two terms, even as many Republicans say they would not support those cuts. John O’Grady, the president of the EPA’s largest union and a former project manager for Superfund sites across six states from 1994 to 2004, said he worries that other portions of the report suggest the potential for reduced liability to responsible parties. One recommendation in the report would allow third parties to assume liability from the responsible party, potentially protecting the latter from legal action. Richard L. Revesz, Lawrence King Professor of Law and director of Institute for Policy Integrity at New York University, said while he is encouraged by the EPA’s move to address Superfund sites, the report did not clearly describe how the agency would work with responsible parties. Kelly gave few specific details on how the EPA would work with potential responsible parties to orchestrate the expedited clean-ups of Superfund sites. Since his appointment as chair of the task force, Kelly has come under fire for his background as a banker and because he has no experience working with the Superfund program. “Given the enormous business influence on the administration and the fact that people that Pruitt has brought to this and other environmental tasks are coming from the regulated sector, one worries about how the streamlining ends up working out in the ways that are consistent to the public interest,” Revesz said. When asked about those criticisms, Kelly dismissed them. The report also recommended creating a “Top 10 list” of the sites most in need of remediation. Pruitt has said he would personally oversee any Superfund site costing more than $50 million to remediate. Last week, Pruitt indicated the West Lake Landfill in St. Louis County, Missouri may be a potential target for the list. Filled with noxious fumes, radioactive waste and refuse, some dating back to the nuclear tests of WWII, the landfill was declared a Superfund site in 1990 and has yet to be remediated. Dawn Chapman, who lives less than 2 miles from the site, co-founded the group “Just Moms STL” three years ago, to push for action. The group’s Facebook page has more than 3,700 followers and hosts monthly meetings at a local church. Chapman said she’s met and spoken with Kelly during the last several months, but still remains skeptical, especially over the report’s suggestion that the EPA minimize the costs for some responsible parties and in light of the proposed EPA cuts she believes would lead to more delays. “Scott Pruitt is making some pretty strong promises, and I really hope he understands that minimal fixes at these sites — coming in on these sites with these little top-10 lists and putting a Band-Aid on these sites and trying to minimize the costs of the responsible parties — that’s just not going to fly,” Chapman said.